Greystone was originally the name of the huge 400-acre Beverly Hills ranch of the Edward L. Doheny (oil and later real estate) family. Doheny built the magnificent fifty-five-room stone mansion in the late twenties for his only son, E. L. Doheny Jr. Three weeks after the younger Doheny moved into Greystone with his wife and five children, both he and his male secretary were found dead in Doheny's bedroom. The official version of the story says that the secretary shot Doheny and then himself when Doheny refused to give him a raise. Another version of the events suggests that Doheny and his secretary were lovers... and that it was Doheny who fired both shots, possibly because he feared that their affair was about to be discovered by his family. No matter what really happened in 1928 in Doheny's bedroom, Greystone remains one of Beverly Hills' most impressive estates - and unlike its counterparts, this is one great property that is open to the public. That's because the City of Beverly Hills bought Greystone and eighteen of its original 400 acres in the mid-1960s. (Most of the rest of the acreage has been used for the ultra-exclusive development called Trousdale Estates, former residents of which include Richard Nixon and Elvis Presley.) In 1971, Greystone's grounds were made a public park, while the main house served as the headquarters for the American Film Institute's film school. After the AFI moved to East Hollywood in 1983, the City of Beverly Hills restored the mansion to its original condition, which made it even more desirable for location shoots. For more information, check out my Shot On Site article. The park and grounds are open to the public and admission is free. 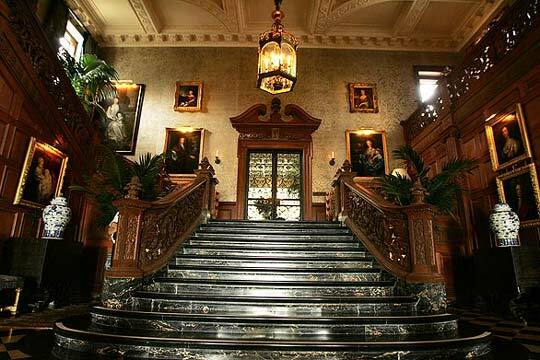 The mansion interiors are not open to the public, though you can pay to have a wedding or special event hald there. Bobby Brown will be your doorman for an additional fee. Greystone Mansion is also known as Greystone Estate. The ghostbusters have their meeting with the mayor in the Drawing Room. In the movie, curtains are used to hide two doorways on one side of the room, as well as the huge three-frame window that's on the wall between the two doorways. The real Gracie Mansion can be found on East End Avenue at 88th Street in New York City. Gracie Mansion is designated as the official residence of the mayor of the City of New York, but it is not a requirement that the mayor live there. In Ghostbusters II, the "Gracie Mansion" plaque placed on Greystone Mansion reads, "Originally built in 1779 remodelled in 1799 for Archibald Gracie. Purchased by the City of New York in 1897. Selected as the official mayoral residence in 1942." This is not entirely true. The house known as Gracie Mansion was built by Archibald Gracie in 1799. It was not built in 1779, at which time the property was owned by others and used for other purposes. The City of New York appropriated the estate in 1896, not 1897. It is true that it was designated as the official residence of the mayor in 1942 when Fiorello La Guardia moved in. John (Bill Murray) and Russell (Harold Ramis) meet up with their dates, Stella (P.J. Soles) and Louise (Sean Young), at the Schloss Von Hapsburg resort in Germany. The resort, of course, is the Greystone Mansion in AMERICA! You can buy the movie on DVD (Theatrical Cut) and Blu-ray (Extended Cut). Just avoid the Extended Cut DVD for the reasons I give in my Blu-Ray review. After their harrowing ride in a car with no brakes, Harry Crumb (John Candy) and Nikki Downing (Shawnee Smith) meet back at her family's mansion to discuss the case of her kidnapped sister. While the University Women's Club of Vancouver at 1489 McRae Avenue, Vancouver, British Columbia, Canada was the Downing mansion in most shots, for this one scene, the Greystone Mansion was used. I suspect that it was a pick-up scene done later after the principal photography had finished in Canada. You can buy the movie on Blu-ray (reviewed by me here) and DVD. Graham (Jude Law) and Amanda (Cameron Diaz) go on a dinner date at a fancy restaurant, which is actually the Greystone Mansion's Drawing Room. You can watch the scene online, or buy the movie on Blu-ray, DVD, a two-disc Blu-ray Double Feature with Hitch (starring Will Smith and several NYC filming locations), or a one-disc DVD Double Feature with Christmas With The Kranks (starring Tim Allen, Jamie Lee Curtis, and Dan Aykroyd).